See and hear the resident hippos! 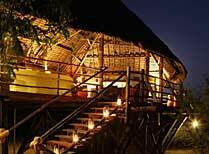 â€‹Azura Selous (formerly known as Amara Selous) is a luxury camp in Selous offering you space and privacy. All 12 suites are river facing, so you can sit and listen to the sounds of the rapids on this stretch of the Ruaha River in the middle of Tanzania's Selous Game Reserve. This is a very stylish camp. Your tented suite not only has ceiling fans but is air conditioned. The private viewing deck comes complete with your own plunge pool and there's even butler service, though it manages to be informal and discreet. The camp certainly fulfils its owners' wish to provide space and privacy. In accordance with this food is served at indivudal tables rather than communally, and in a munber of different locations. Staff enjoy making each meal time a special occasion. In terms of activities, there is a good choice from game drives to boat safaris (when the river is high enough), walking safaris to fishing, bird watching to scenic sundowners and a great range of spa treatments for those chilling out times in between wildlife viewing. If you're looking for something wonderful, perhaps for a honeymoon or other special occasion, Azura Selous should be on your list. It is also family-friendly, welcoming children over the age of 6 and has a children's club. Open: Open all year, except for April and May. Location: Azura Selous is on the Great Ruaha River in the western Selous Game Reserve. The closest airstrip is Simbazi which is about a 3 minute drive away. Rooms: There are 12 suites, all with large decks facing the river. The rooms are partly tented and partly walled and cover 90sq m. They're very spacious and air-conditioned and have ceiling fans. The bedroom is a large, self-contained tent with a comfy bed, desk, radio for room service and emergencies, iPod dock, safe, power points for charging batteries, torch and cool box. Zipped doors open onto an expansive deck with 2 chairs, a table, 2 loungers or deck chairs and a plunge pool. The en-suite bathroom has twin hand basins, a shower and toilet and there's an additional outdoor shower. The rooms come with your very own butler. Activities: The main activity here is game drives. The vehicles are open, though they have a high shade roof to protect you from the sun. Different durations of drives are available with picnics supplied for all-day safaris. Night drives are also offered. 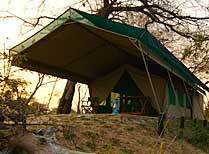 The camp also offers walking safaris with a specialist walking guide and an armed scout. These are not challenging hiking, but gentle walks with a focus on the smaller things in the bush. Bird watching walks are popular. Catch and release fishing is popular. Bush breakfasts and dinners can be arranged. You can take boat safaris, but only when the river is high enough, which is not all that often. These are great for giving you a different aspect to your wildlife viewing - and very relaxing! In between wildlife viewing you can also enjoy spa treatments, either from the privacy of your room, or you may prefer some quiet spot outside. Facilities: There is a dining area and a separate raised bar and lounge. The lodge has a lovely swimming pool and deck with sun loungers, overlooking the river. There is a camp fire. Spa treatments are available in your tent. There is a laundry service. Dining: Private dining as opposed to one large table hosted by the manager. Tables can be set in various different places to make even the experience of eating a unique or special one. There is always a choice of food rather than a set menu. Outdoor barbecue dinners are usually held twice a week. Children: Children are very welcome here from the age of 6 years. From 6-13 years the price is nominal if the children share the parents room, triple and quadruple share are available for parents with children under 16. There is also a children's programme and guides who provide special activities for youngsters. The minimum age for walking safaris is 12. Communication: There is an intermittent mobile signal in a few places. There is free Wi-Fi in the lounge. This is a high quality camp with extremely spacious accommodation and excellent facilities including a swimming pool. 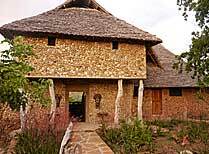 Sand Rivers has 8 open-fronted, thatched ensuite stone cottages set along the riverbank in luxurious comfort. 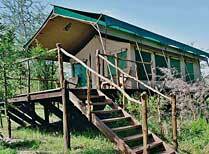 Siwandu is a luxury camp in Selous Game Reserve, a perfect safari destination. Lake Manze Camp is in the heart of Selous Game Reserve. All 12 tents have views of the lake. 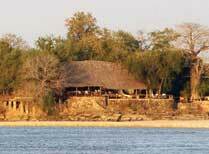 A luxury tented camp by the Rufiji River in a game rich area of Selous. "This was like coming home; the people were so friendly. It was delightful. And it was elegant - but not in anyway intimidating. Food was fantastic, the knowledge and friendliness of the guides was wonderful. Game drives were fantastic, as was the view of the hippos in the river at the end of my 'garden' (and the sound of their 'song!). Highly, highly recommended." "All staff at Selous were fantastic, we were met off the flight and from then on we were treated to 5* service - from our housekeeper, our butler and our guide, they were all fantastic. They were always there when you needed but we're not in any way over bearing. Our tent was v comfortable and the plunge pool was v much appreciated after a morning on safari. We both loved our safari experience and can't speak highly enough of Azura Selous!" "Karen and Jason who ran the lodge were fantastic and the little surprises they arrange along the way are wonderful (don't expect to ever eat dinner in the lodge restaurant)... The river views, the laid back but fantastic operation of the lodge and brilliant guides/hosts really made Azura very special. "